On cursory inspection, your bones don’t look like they do all that much. Let’s dispel that myth right away. Our bones are constantly changing, with new bone being built and old bone being eaten away all the time. 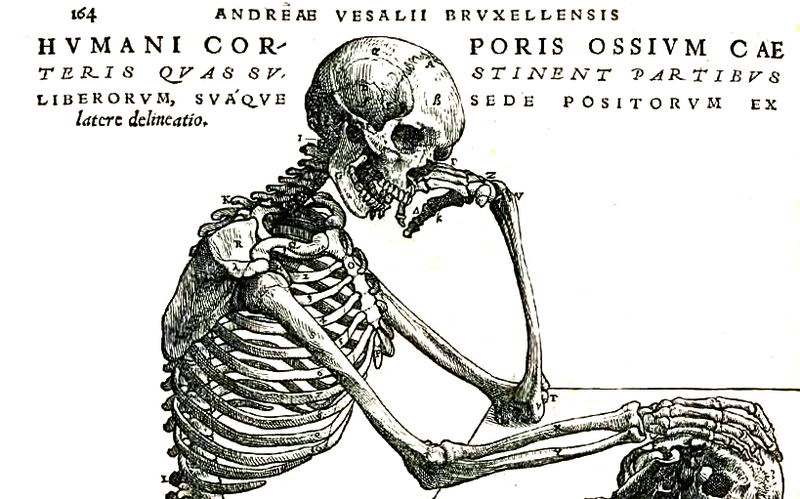 Your skeleton completely replaces itself roughly every 10 years. I’d rather talk about bone the material and how it’s made. And to understand that, you have to look within your bones at how they’re structured and built. The seemingly solid, hard outer part of bone, called compact or cortical bone, isn’t solid at all. Rather, it’s a dense but still porous network of cells and proteins. Inside is softer material called cancellous, trabecular or spongy bone. This is where you find the marrow, which we’ll get to shortly. All of this is wrapped in a layer called the periosteum, full of nerves, blood vessels and connective tissue. So what’s all this stuff made of? Let’s start with the cells. You have two different groups of cells in your bones: ones that make bone, and ones that eat it. Osteoblasts and osteocytes. These little guys are the bone builders and mechanics. Osteoblasts are young cells that produce a mix of proteins called osteoid, the raw material of bone (more on this in a moment), as well as a number of hormones. Osteocytes are mature bone cells that have been trapped in the matrix of hardened osteoid and which help maintain bone. They can also tell when your bones are placed under physical strain — say, from weight lifting — and help produce more bone in response. Osteoclasts. These are the bone eaters. Osteoclasts release enzymes that react with the mineralized part of bone and break it down so that new bone can be built up. All of this sits embedded in the bone matrix, the mix of organic (protein) and inorganic (mineral) material in bone. Matrix is full of collagen and other proteins from osteoid (which comes from the osteoid made by osteoblasts). Arranged into long fibers that act like a kind of scaffold for your scaffold, the collagen gets encrusted with crystals of bone mineral. Also called hydroxyapatite, bone mineral is the part that contains calcium (which we get from the food we eat, the milk we drink, and calcium supplements). 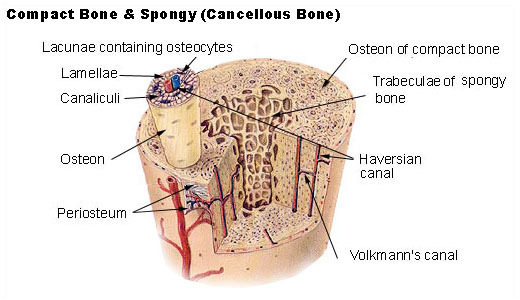 The mixture of the two give bone it’s hardness (from the hydroxyapatite) and flexibility (from the collagen). You’ll notice that so far I haven’t really talked about the bone marrow. That’s because it’s a different beast altogether. Within your bones is the spongy bone we talked about earlier. 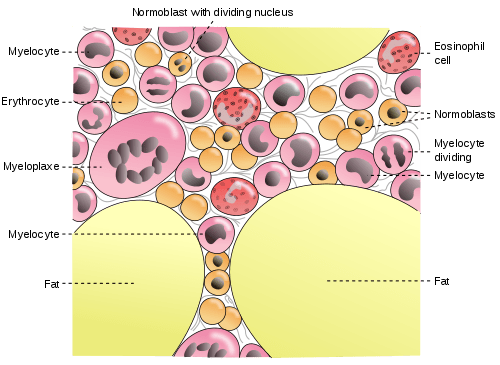 Depending on where you look, that spongy bone is embedded with either fat cells — in which case it forms what’s called yellow marrow — or hematopoietic (hee-MA-toh-poy-EH-tik) stem cells — in which case it forms red marrow. Red marrow is where your blood and immune system are built. Hematopoietic stem cells produce the red blood cells that carry oxygen in you blood, as well as and the white blood cells (the group name for cells like B cells, T cells, macrophages and more) that fight infection. When someone gets a hematopoietic stem cell or bone marrow transplant — which is frequently used to treat some kinds of cancer — what doctors are doing is destroying their native bone marrow with drugs and radiation and then replacing it with bone marrow from someone else.